A new eye-opening op-ed in Politico brings fresh realism to the fact that "Europe’s obsession with Russia is unrequited" as "Moscow just isn’t interested in the Continent anymore." Because instead it's now "all about China" from Moscow's vantage point, now all-in on its long stated intent to convince Beijing it's time to form an alliance capable of breaking US global hegemony. Bruno Maçães, a former Europe minister for Portugal and Eurasian affairs analyst finds based on the real discussions taking place in diplomatic corridors (as opposed to the abstract talking points of mainstream western pundits — predicated on the assumption that Russia perpetually seeks to pull Europe in its direction), that Moscow is no longer pursuing European integration following sanctions and the unraveling of the INF, but senses a new opportunity given Washington's tariffs on Chinese exports. No longer, the ex-European diplomat concludes, does Russia hope to emulate or compete with the Chinese economy, which it realizes it can't do, but instead has a bigger geopolitical alliance in mind. 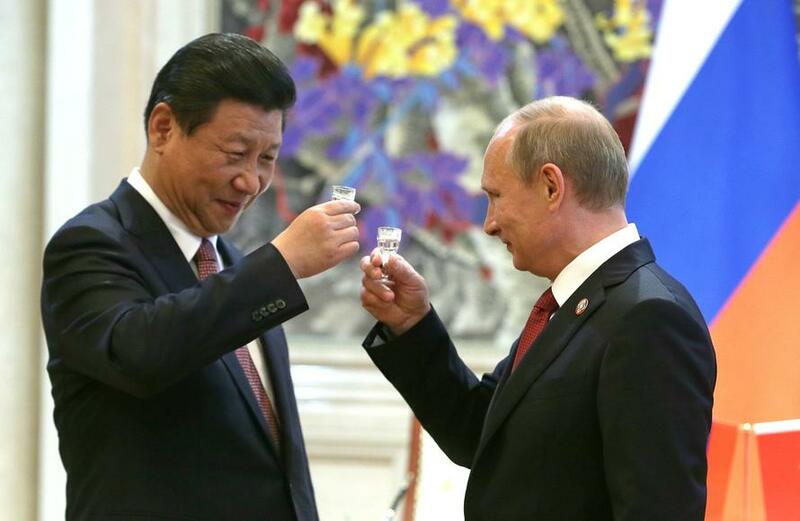 Presidents Putin and Xi toasting a 2014 energy deal, via ZUMA news agency. Accordingly, relations in Europe is now a distant afterthought for Russian policymakers; instead the question is how to get Beijing to finally understand that Washington is the real enemy, making an alliance against the US necessary. However, the question remains, according to the former Portuguese diplomat: "Can Russia and China really be friends, and for how long?" The dramatic implications for global order? "It would be an entirely new world, and it’s one that is coming closer to becoming reality," he concludes. Such an alliance "would overturn how we do global politics." "Imagine an international crisis in which Russia and China suddenly emerge as a single bloc. The impact would be considerable, and to some extent unpredictable: Psychologically, in the mind of the West, it would combine the fear associated with Russia with the apparent invulnerability of China," forecasts Maçães. Ultimately, this would be enough to curtail Washington-NATO hegemony, as the US "would feel under attack; Europe, intimidated and unsettled." This "entirely new world" would also introduce fractures among European allies, as "The old Continent would also face the threat of a split between Western Europe and the nations of Central and Eastern Europe, which could turn their focus east under the influence of a cash-happy China ready to invest in the region." Yet China appears nowhere close to Moscow's level of enthusiasm for so drastically altering the landscape: "For the moment, Chinese prudence remains the great obstacle to the new alliance. And Russians know this," Maçães concludes. Maçães continues, summarizing Karaganov's message: "If Beijing places its bets on peace and cooperation, the great Chinese adventure will come to an end, and China will have to live in the shadow of the U.S. for another generation — perhaps forever, Karaganov said." The message is further that the clock is ticking on Beijing's waking up to what Russia sees as permanent US global dominance: "Chinese authorities, he argued, have no more than five years to make a decision." However, China could soon be at breaking point with Washington but would unlikely want to sever itself from European markets and technology. A proposed new "Eastern bloc" would be a powerful geopolitical weapon, no doubt, but the unpredictable high cost will likely prevent Beijing from the taking the leap in Moscow's direction.